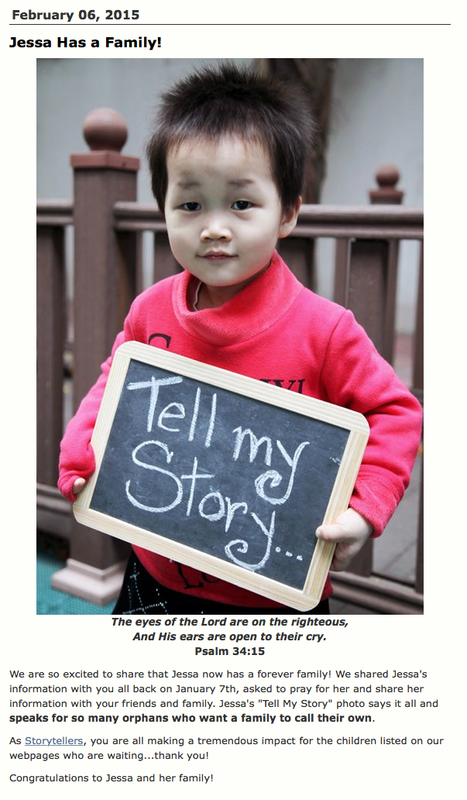 Julie Dawkins Family: Throw back Thursday "Jessa"
I will always have a little twinge in my heart when looking back on Luke's baby pictures knowing that Caroline was already in an orphanage in China somewhere. And how desperately we wish we could claim that time in her life as ours to save her from all that she endured but she was in God's hands and he had a plan for her life that only worked in HIS timing not ours. Her papers were ready the same week ours were ready not a moment sooner. And she didn't stay a moment longer "waiting" for a family than the paperwork process took. I like to remind people that it took a team of missionaries (storytellers) to go and encourage the staff to ready her paperwork. They too are a part of her story and ours. Up for a mission? I know I have never shared this because at the time I just wasn't sure of the rules. China doesn't want you showing a picture of the child you choose until they give approval which is a few months later. I absolutely did not want to break China's rules in fear of not knowing if they wouldn't let us have her. So we kept this to ourselves. On my Facebook page I'm often advocating for orphans ready for a family. And then somedays rejoicing when families have taken step of courage and followed the Lord's leading for their family and accepted one of those children. On February 6th of THIS year this was the post on the America World Adoption Blog Anyone recognize Jessa? For those who will ask Jessa is the name the agency gave her (it was never her "real" name) as they advocated for her since she was on the waiting list. Being on the waiting list meant that they did not have a family that fit her description of a special need. And as it turns out her only special need was that she needed a family. Her label though sounded scary but turned out she was just slow to walk... maybe because of lack of parental attention we will never know. But whatever the reason God knew and it was THE reason she was eligible for international adoption. On June 17th we brought "Jessa" home as Caroline forever our daughter. God has a plan for this girl and I can't wait to find out what that plan is!